Crafting With Craig: "A pocket full of posies" 8x8 card. Good evening, hope you have all had a lovely day with this gorgeous weather. Had a lovely day today, so delighted that francos cafe in Carnoustie are now stocking my card to sell to help raise money for Crohn's and colitis and dogs trust uk. I'm so excited about this new chapter. So please pop in and have a look. Take some time to yourself and have a cuppa. 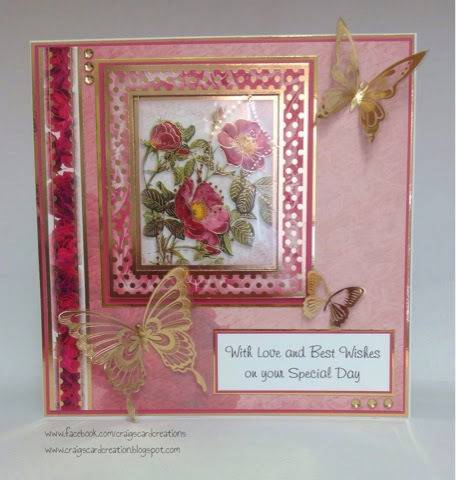 I have made this card using Hunkydorys latest collection Radiant Roses. The products I have used are as followed. Craig. I might just pop over to Carnoustie and have a cup of tea in the cafe. Use to live at Easthaven so a walk along the beach there with the dog I think is on the cards.